We are now hitting last minute territory and loads of best men and chief Bridesmaids are franticly crawling the net looking for that last minute stag do or hen party. We feel so strongly that we can help you arrange that special weekend with no fuss and stress to you, we have dedicated a special page to help you get started. Alternatively, go here if you have a last minute hen party to arrange. We will then get to work and make your celebratory weekend a reality, you can then ride the hen or stag do wave in true heroic style. When the sun is shining in the UK there is no better place to be, and one of the best places to have your last minute celebration whether you’re on a hen or stag do is Bournemouth. 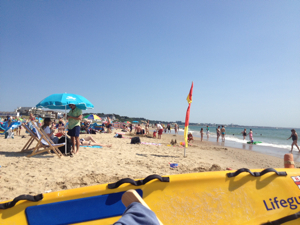 The beach in Bournemouth is clean, the water is clear and the weather on this south coast is usually the hottest in the UK, recent temperatures have hit 30 degrees Celsius. So you just need to pack your bucket and spade, frisbee, bat and ball and head to the south coast. But hold on, all the hotels are fully booked, how can I get my hen or stag party down there? Well luckily that’s where DesignaVenture come’s in, we have a list of hotels as long as both your arms and both your dangly legs. All we need to know is when you want to go, how many people and for how long we can then find you a hotel quicker then then you can say “I DON’T LIKE SALT ON MY CHIPS”. At night once you have creamed your sunburnt bodies Bournemouth has some fantastic restaurants, bars and clubs with an atmosphere good enough to cuddle making it one of the best destination for your hen or Stag do, especially when the weather is so fine.